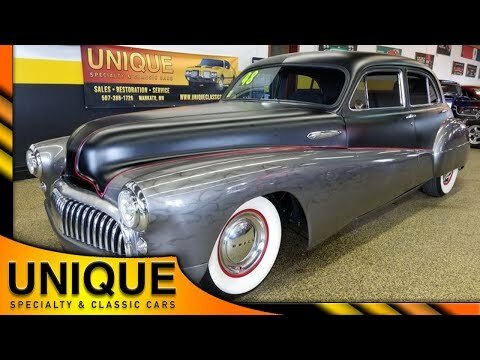 1948 Buick Roadmaster Street Rod, V8, Air Ride, AC, MUST SEE! TRADES? 1948 Buick Roadmaster Custom Sedan Street Rod, under the hood is a 350 GM V8 paired with a Turbo 400 automatic transmission.. Mustang 2 front suspension, Wilwood brakes up front. Air Ride Technologies air ride suspension. Paint is a matte black and dark gray gloss bottom with red pinstriping. The hood is a piano-style hood. Paint is in great shape. Rear fender skirts. Frenched in taillights and marker lights on the side. Vintage air. black and gray themed interior. Custom two-tone bucket seats. Parking brake on the center console with window controls, Cup holders, and air ride controls. Tilt steering. Custom dash with vintage air controls. Aftermarket gauges. Kenwood stereo. Suede headliner. Great running and driving Buick street rod.